Wild horses experience many benefits from going barefoot, and now domesticated horses are beginning to experience the same benefits as farriers learn barefoot hoof trims. Unlike pasture trims, in which hooves are shaped for the temporary period in between shoeing sessions, barefoot trimming shapes the hoof for natural movement on varied terrain. Barefoot trimmed horses can perform equally as well as shod horses in many equestrian disciplines and experience fewer hoof problems than shod horses. Barefoot trimming is less expensive than typical horse shoes. Although you can save some money by using only front shoes, most horse owners who shoe their horses spend over a thousand dollars a year or more on farrier visits. Horse shoes must be replaced every six to eight weeks. 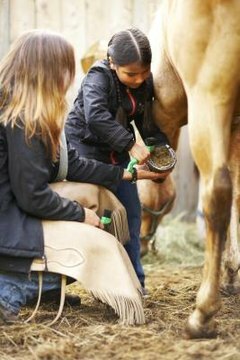 Barefoot trims must be done more frequently, but horse owners can learn to do simple trims at home, thus reducing or eliminating the cost of expensive shoes and farrier visits. Because barefoot trimmed horses are moving naturally, they tend to develop better muscle tone faster than shod horses. Erica K. Frei, in an essay on Writing on Riding, notes that a horse with poor muscling along the top line who was subsequently left to go barefoot improved his muscle tone within one week with no special training. The barefoot trim improved his natural muscle tone by changing the way the horse moved. His gaits improved, and he stumbled less frequently after the barefoot trim. Dr. Robert Bowker conducted studies of blood flow to the hoof of barefoot trimmed horses. He concluded that the horse's hoof receives nearly twice as much blood flow when barefoot as compared to a shod horse moving on similar terrain. Improved blood flow to the hoof improves the overall hoof health by increasing circulation throughout the entire hoof. The hoof can also flex better without shoes, providing more cushioning for the hoof and leg. Barefoot trimming can also improve lameness or make a horse sound again. Horses may become lame from navicular bone changes, diseases such as laminitis, abscesses or other hoof problems. By removing the shoes and giving the horse a barefoot trim, the angle at which the hoof strikes the ground is changed back to a more natural angle. The result can take the pressure off of painful spots and enable the horse to move soundly again.